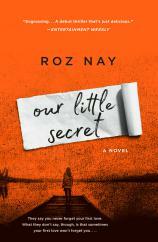 Let us add Roz Nay to our list of must-read authors of psychological thrillers. 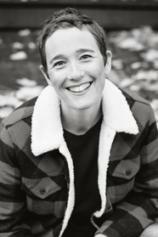 Her debut novel, OUR LITTLE SECRET, begins strongly and ends the same way with a sure-footed, first-person present narrative guided by Angela Petitjean, who is a person of interest in a disappearance and possible murder. It is a tale that has everything, except a good place to stop reading...other than its last sentence. What Nay captures so perfectly here is the romantic angst that occurs when a decision to become the away team following high school graduation tears two hearts asunder. We all know the feeling, and everyone reacts differently. That is certainly the case here, as we learn through Angela’s account, which moves at will between her past and present. The difference, though, is that Angela isn’t talking to the reader. Rather, she is in a police interrogation room in her hometown of Cove, Vermont, being put through the paces by homicide detective Jonah Novak. The concern that has motivated him to bring her in for questioning is that a woman named Saskia Parker is missing. "No one really knows all of the answers until the final few sentences, which send the reader’s expectations and conclusions ping-ponging back and forth." Saskia is the wife of HP, who was Angela’s high school sweetheart. The account we get is somewhat one-sided, given that it’s all Angela, all the time, but what we do learn is that Angela is naturally more sinned against than sinner. It was HP who initially rescued her from the fate of being the new duckling in high school after her family moved to Cove. HP was the school’s star athlete, and he scooped her up, wooed her and made her his own. It was Angela’s parents who insisted, notwithstanding her relationship with HP, that she accept an offer to study at Oxford (the one in England), a request to which she acquiesced. That made HP and Angela mutually geographically undesirable, but we come to learn that they struggled mightily and successfully against it, at least for a while. It was not until HP and his wingman traveled to England for the purpose of visiting Angela that things blew up. By the time the dust settled and the smoke cleared, Angela was on her own, and HP was trapped in the vaginal web of a winsome Australian lass named Saskia. In the story’s present less than a decade later, HP, Saskia and their young daughter are living in Cove, as does Angela. Everyone has moved on emotionally. Angela has even moved in with HP and Saskia, functioning as their nanny. But if everyone is getting along so well, why is Saskia suddenly missing? The reader has a leg up on Novak, given that Angela is telling us more than she is disclosing to him. She, of course, isn’t telling everything to everyone, but Novak isn’t revealing all that he knows, either. No one really knows all of the answers until the final few sentences, which send the reader’s expectations and conclusions ping-ponging back and forth. The best lines go to Angela’s mother, who is quoted by Angela throughout the book. It is Mom who had been hoping that her daughter, who she seems to regard as the greatest little girl who ever walked the earth, would wind up bedded and wedded with the apparently irresistible HP and is oh-so-disappointed when that doesn’t occur. There are also some hints that maybe, just maybe, there’s a little something more to Angela than she’s telling us. For example (and I may be reading too much into this), there’s a delightfully dark throwaway line from Angela that has to do with the decoration on a baby’s birthday cupcake, which may be innocent or totally inappropriate. That said, I was two-thirds of the way through OUR LITTLE SECRET before I decided who had done Saskia in, if indeed someone actually killed her and she wasn’t simply larking about to create some drama, as Angela suspects. I was kept guessing, and so will you.